So, back to the Church Search Matrix today. 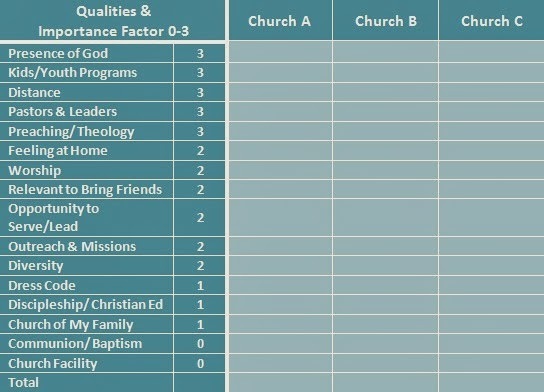 Reminder: The church search matrix is about clarifying what’s important to you and what’s important to the church, then taking it to God in prayer. I got a pile of feedback when I asked about what's important to you on my Facebook page and Twitter. Not as much on G+. Let's look at the first four factors: presence of God, kids/youth programs, distance, pastors and leaders. First of all, there’s a difference between being in God’s will and being in God’s presence. In other words, it’s great to do all the right things but I want to also rest in the glorious presence of God. Am I saying there’s an experiential aspect to walking with God? Yes, I am. The kid thing is what’s shaking us up right now and causing us to look around. Our church has wonderful children’s and youth programs, but our eleven-year-old doesn't know the kids there. We’ve tried reaching out to families. They were great. Really great. We had lunch in their homes. We hung out and connected…then we drove back to our city. The power of passing on godliness to our kids at church can’t be overstated. We are molding the next generation. We are shaping our beloved children. Student ministry is a big deal. Yeah, they met every day. Church meetings are on Sunday, usually, but there are dozens of interactions that happen every day through the week. THAT is church. Church doesn't dominate but it weaves through the rest of our activities and relationships. Church is who we are. Being 30 miles away makes us feel schizophrenic. It’s unwholesome. Maybe for someone else 30 miles is doable. Maybe we’ll need to find a way to make it work. Staying connected vitally with a church across the country? That would be a stretch. I love pastors and church leaders. I love the shepherd’s heart. Are the values and gifts of pastors and leaders an important part of how my family’s values will fit with the church? Absolutely! Do I expect perfection? No. I expect safety. I expect freedom from manipulation. How pastors handle authority is important to us. Overbearing, domineering church leadership borders on cult leadership. It scares the bejordan out of me! In a while we’ll look at servant leadership. Seems to me that’s Jesus’ style. One way or another, our relationship with church leadership will be a big factor. Then you add it all up...and pray!!! God, here's what we are seeing. Where would you send us to find a home and make a difference? These four factors are very important to my family and I? How about you?